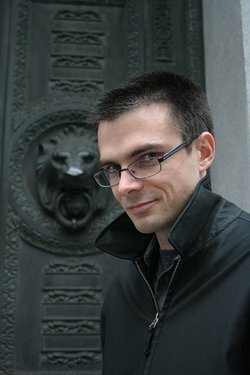 Today I have the privilege of interviewing speculative fiction author and founder of The Crossover Alliance, David Alderman. My name is David N. Alderman, and I have been a full-time self-published author for more than 6 years now, although I’ve been writing since I was 11. I am currently the operator/owner of The Crossover Alliance, an online publishing company specializing in edgy Christian speculative fiction. Most days, I’m sneaking in work and writing around my 4-year-old’s daily schedule. In my free-time, I enjoy video gaming and reading. For the last ten years, I have participated (and successfully completed) National Novel Writing Month. I’ve been writing since I was 11 when my sixth-grade teacher asked us to write a short story. I fell in love with writing almost immediately. I started writing episodic short stories about action and adventure, drawing inspiration from my classmates at the time. I eventually compiled those short stories into my very first novel at the age of 16. It was around that time that my grandmother – who was a huge supporter of my work – was diagnosed with breast cancer. On her deathbed, she lost most of her memory of who was in the room with her, but she looked at me and asked me how my novel was coming along. The very fact that she remembered my writing has given me the strength and inspiration to keep writing all of these years. Now I’m 36, and I write full-time and run a publishing company. Most of my earlier writing can be considered young adult, but back in 2007 during National Novel Writing Month, I sketched out a darker, more adult-content filled story about the end of the world. This story exploded into a four-book series called Black Earth. I had written in a new genre that I eventually titled ‘edgy Christian speculative fiction’ – Christ-centered speculative fiction with real-world content. I eventually ran across other authors who were writing in this unknown genre which led to the creation of an online community. The community eventually turned into a full-blown website, and the website has since leaped into an actual online publishing company. Tell us about The Crossover Alliance - its mission and its ambitions. The Crossover Alliance was birthed out of a need for a way to both network with other authors specializing in Christ-themed speculative fiction with real-world content and to satisfy readers’ desires for this type of fiction. As authors, Christian publishing companies think our content to be too ‘edgy’, while secular publishing companies consider our content to be too religious. So we created our own publishing company. The Crossover Alliance’s mission is to reach the world with Christ through compelling fiction that isn’t confined to the boxes of traditional rules. Our content is required to adhere to Biblical beliefs and core doctrine, but may also contain edgy or dark content that isn’t usually found – or allowed – in Christian fiction. This first year, we plan on publishing a total of 9 books before next July, and each year thereafter, we will strive to publish at least 6 books per year. We’re a small company right now – in the beginning stages of something much, much bigger. We are methodically setting the foundation blocks one at a time to build a reliable, full-blown publishing company offering all of the amenities that the ‘big’ publishing houses currently do while giving writers the (responsible) freedom to write the fiction that they are led to write. I am currently writing a short story titled, unLoved, for the upcoming second volume of The Crossover Alliance anthology. I am also about to begin a complete overhaul on the third volume in my Expired Reality series, as I’ve written two full-length novel drafts which I have become increasingly unhappy with over the years. Along with those, there are possible audio projects in the works, and even a standalone novel idea I might begin work on this November for National Novel Writing Month. I have a website/blog that you can check out at www.davidnalderman.com. I am also on Facebook at www.facebook.com/davidnalderman and Twitter at twitter.com/davidnalderman. 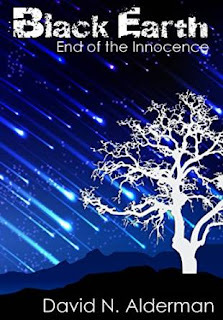 David's latest book Black Earth: End of Innocence, has just released from The Crossover Alliance! Click here to find out where you can get it in digital and paperback!